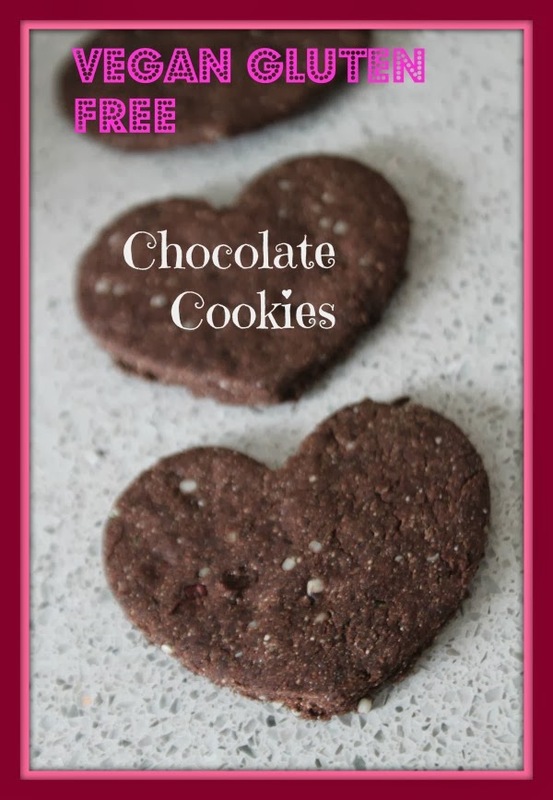 MamaEatsClean: Happy Valentine's Day - Celebrating with Heart Shaped Chocolate Vegan Gluten Free Cookies...........that are school safe! Happy Valentine's Day - Celebrating with Heart Shaped Chocolate Vegan Gluten Free Cookies...........that are school safe! Happy Valentine's Day Everyone! Or Valentine's Week................I'm a bit early. I had to get some cookies baked for my daughter's Valentine's party as school. Because she unfortunately can not share in all the treats her friends will be bringing. She can't have gluten, dairy, refined sugar, eggs or soy. And of course she can't take nuts to school. We basically have to pack her separate lunch, snacks, treats, cake, cupcakes - whatever- every time she goes for a play date, birthday party, school party, etc, etc, etc. She is actually okay with it for now. It doesn't seem to bother her. Probably because I'm always trying new recipes and making her tasty treats. But man is it time consuming. This is why I can't work full time. Seriously. I spend a LOT of time in my kitchen. Which I love but even I have my limits. But............she got her first ear infection in well over 2 years this week. In the first 3 1/2 years of her life she had NUMEROUS ear infections. Until we changed her diet. And she stopped having them. It was a great reminder of how far we have come. And how it is all worth it if it means she is healthy. And happy. Even if its time consuming. So I will keep baking her special treats. And she won't need to feel different. Just special! Remember - my recipes are super low sugar. Add more sweetener if you want. Or dip them in melted chocolate to sweeten them up................that can't be bad! In a separate mixing bowl combine all wet ingredients including Chia gel. Roll out dough until about 1/8 inch thickness on a piece of parchment paper. Cut shapes out of dough and transfer to lined baking sheet. I just kept reusing the scraps (forming into a new ball and re-rolling out) until there was no dough left. Let cool and decorate, dip in chocolate or just eat as is.